Season Eighteen is, quite possibly, the most talked-about season in fandomn. When it first came out, reactions were extremely mixed about it. With time, opinion regarding it appears to have changed quite a bit. Most seem to see it, now, as a very sophisticated yet techno-babble-riddled collection of "hard sci-fi" stories. And that, for better or worse, John Nathan Turner had re-invented the series and was taking it in bold new directions it had never really been before. And yet, we have a story in Season Eighteen like "State of Decay" (we also have a story like "Meglos" that is very much in the same vein as "Decay" but that's a whole other story). As much as we want to say that Season Eighteen was a harsh departure from the type of stories the show had been doing up until then, "State of Decay" laughs in the face of this idea. It is a traditional Doctor Who story - focussing on characterisation and adventure and telling a very straightforward plot. And, as much as I enjoyed all the high concept stuff of "Warrior's Gate", "Leisure Hive" and suchlike, "State of Decay" succeeds as well as it does cause it has a nice touch of "Old Who" feel to it. It was JNT's way of re-assuring us that he hadn't totally forgotten what the show was supposed to be about and would make sure to still give us some of that now and again! Even the illustrious Tom Baker - who is very grim throughout most of the season - seems to lighten up a bit here. He certainly seems to be giving us a bit more slapstick with jokes like "You're standing on my foot" and getting hit in the face with a door. But, by no means is he allowed to go as silly as he did in the previous season. He recognises the "flavour" of this adventure and adjusts his performance accordingly for it. He can have a bit more fun in this story because the story, itself, is a bit more fun. But, because this is still Season Eighteen, he makes sure not to go too far with that humour. He also makes sure to give us some nice serious moments in his portrayal too. The scenes in the TARDIS where he learns about the legend of the Great Vampires are played very straight. Even as he gives a kick to the card files on the floor, he is conveying real anger rather than going for a sight gag. And because of the drama of those scenes, they're some of my favourite in the whole story. But, as great as Tom is in this episode (as is Lalla too, of course - the two of them are one of the best Doctor/companion combos), our wonderful Three Who Rule really steal the show. Like Tom, they have some fun with their parts but make sure they never take that fun too far. And because of that restraint, there are some really chilling moments between the Time Lords and their ancient enemies. Some real creepiness going on - even with the silly eye make-up! Playing a vampire is not easy. I can say that confidently because I actually am a proffessional actor who was cast as one in a play! And, like "State of Decay", the play was trying to take the concepts of vampirism quite seriously. When portraying such a creature, you need to "ooze sensuality". But if you're not careful, those attempts to "ooze" can very quickly turn campy. And all three actors do magnificient jobs maintaining the balance such a role requires. Reigning things in when they need to, but also "eating up the scenery" when the moment is right. But then, one of them had already dazzled me with his portrayal of Sutehk just a few seasons earlier, so I'm not entirely shocked. Although many negative things have been validly expressed about what Terrance Dicks lacks as an author, he really does "get things right" here. This is a tight plot that is still loose enough in places to have some nice "character moments". And not just with the Doctor and Romana imprisonned together. There are a number of moments the two of them have where the chemistry shines. And that isn't just due to the talents of the two actors - Dicks gave them some nice dialogue to convey it. This is a damned good script. And, as much as we all sometimes consider the man to be as much a curse to the show as a blessing, we have to give Terrance the credit he deserves in the crafting of this tale. Of course, some of those effects in the final few minutes really do mar one's enjoyment of this story. Normally, bad visuals don't bother me much in Who - but when so much of it looks so good and then you suddenly have to put up with a silly rubber bat and a rocket ship that looks like it's moving through a "pop-up" book, it really does take away a lot from the story. But it's my only real complaint about the whole thing. Everything else here is done really well. Even Adric isn't all that bad yet. Especially if you compare this to how bad Matthew would act in future tales. I also think far more criticism gets levelled at our little Alzarian brat than he deserves. But that's a whole other rant that I won't bother to get into here! I'll save it for the day when I finally review "Full Circle"! So, hats off to "State of Decay". Not just for the welcome repose it offers us from the "headiness" of Season Eighteen. But because it really is a great little four-parter that serves its purpose well and even expands a bit on the mythos of the Doctor's people. A posthumous thanks to JNT for hanging on to this script when it didn't end up being used a season or two previously. It was worth making sure it got to see the light of day. Even if daylight isn't good for vampires! It is probably impossible to review this story without also having to discuss the new era it heralds. So, let's get that out of the way first. John Nathan-Turner, easily one of the most controversial producers to ever preside over the series, begins his tenure boldly in this story. In fact, this is probably the biggest revisions the series has ever undergone during a producer changeover. It is, at least, a bit re-assuring to notice in the credits that Barry Letts was executive producing the season with him - which means, to me, that JNT probably had an excellent sounding board to work off of as he made the radical changes that he did. The most notable changes are, of course, the cosmetic ones (which is almost a bit of a pun since one of the changes the producer managed to pioneer was getting Tom Baker to finally wear make-up on camera!). We have a new a title sequence, new music and new logo. All very immediate assertions that show us we're about to witness a very different Who from what we've been watching before. Having, more or less, "grown up" with this era of Who - it's probably one of, if not, my favourite title sequences (but then, I thought the Sly McCoy title sequence was okay so what do I know?!). Some fans complain that it only conveys space travel and not time travel and that's part of what makes the previous "birth canal" title sequence better. Which is a comment that has always sort of amused me. The previous title sequence is just a nice special effect. That's it, really. It only became "time travelesque" because they needed something to sort of represent the time vortex during certain stories that depicted it. So they decided to save some money and use the title sequence graphics. By this same logic, the title sequence should also convey "Time Lord Mind Bending" since it was also used in The Brain of Morbius. And, of course, the title sequence that dominated the bulk of the Pertwee era should also convey "Dalek Mind Probe" since its graphics were used in Day of the Daleks! Anyway, I digress for the sake of getting on with the review of the story. The other more obvious changes we see are that production values appear to have either gone up or been used more effectively. Although the sets are still wobbly here and there, they look much better than anything we've seen before on the show. Costumes, makeup and special effects have all improved too. Overall, the design and feel of the episodes look like the money being put into them is either greater or being used much more smartly. Not sure exactly what happened, but it all certainly looks great. By Doctor Who standards, at least. Then finally, in the "blatant changes" department we also have the Doctor's latest costume. I think it best to say that I just plain like it. In fact, I love it. Baker looks great in the outfit and I almost wish he'd worn it for more than just the one season. And, as others have remarked, it greatly symbolises what also occurred with his performance of the role. Which is probably one of the more, but still not entirely, subtle changes this new story heralds. I really didn't have much problems with how crazy and goofy Tom was getting in the previous season. His wit, though a bit overabundant, was still always great fun to watch. And it's a testament to Tom's talent the way he would re-invent the scripts so much during the rehearsal process. Re-writing science fiction "on the spot" the way he did was no small feat. But, I do also think the series could not handle too much more of this. That if he wasn't reigned in the way he was, the show would have become a total spoof of itself. 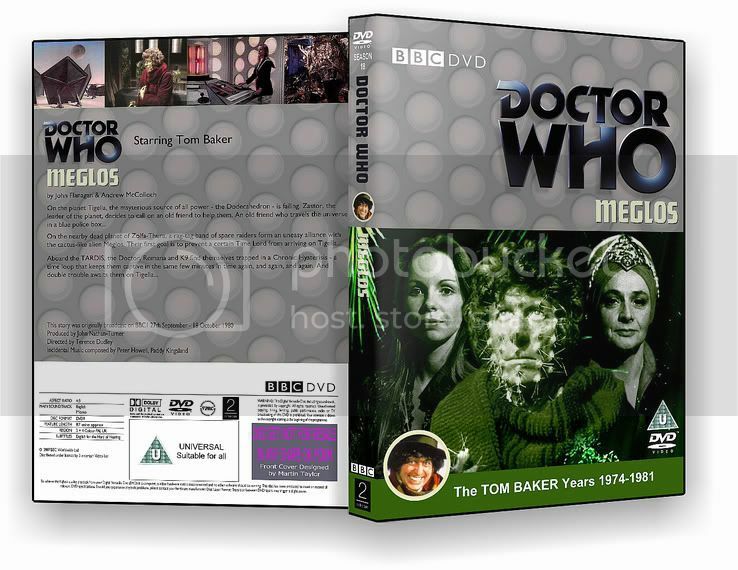 So, even though there's still bits of the "old Tom Baker" here and there - it's kept considerably toned down and made to be a bit more whimsical and clever. The most famous of these examples in this story being, of course, "arrest the scarf!". But other sequences, such as the multiple copies of the Doctor vanishing away in episode four and the real Doctor still not being too sure of himself as being the real Doctor, convey this sort of humour far more effectively and creatively. "Arrest the scarf" was a cheap gag - this sequence was just plain talented writing. Which is, of course, the other more subtle change in this era. The new script editor, Christopher Bidmead, not only gave us a story (and an overall season) that is much more "science fiction- based" rather than "science fantasy-based", he also gave us some of the most complicated, if not, incomprehensible of plots. From a standpoint of pure marketting, this was probably not the smartest of moves as I imagined it alienated a lot of casual viewers. But the artistic merit of this story (and, again, the overall season) is fantastic. I, for one, was delighted to see a story that could not be easilly understood from just one viewing. It gave the series a new-found sense of sophistication and perhaps, even, pretentiousness. But then, whoever said being pretentious was an entirely bad thing? Okay, on to a review of the story, proper! The strongest impression this story leaves behind is the brilliant directing and, more specifically, the cinematography. All the gorgeous transitional shots (particularly the shots of the exterior environment being conveyed outside the windows of the Argolin Hive and then "fading through" to the scenes that were taking place on the other side of them) and tight angles (the discovery of the West Lodge Foamasi's rubber mask inside the closet being shot from inside the closet being a great example of this technique) make this story a visual delight to watch. Only the budget, which is still comparitively low by the North American standards I'm accustomed to when watching sci-fi T.V., act as a detriment to some of the director's effectiveness. It's a testament that Lovett Bickford was capable of doing so much with so little. The other great strongpoint of this story were the aliens. Both on paper and visually. The Argolins and Foamasi are very well-written cultures that seem like "real people" rather than just cardboard monsters. The Foamasi look as great as they possibly could with the budgetary constraints - and the Argolins look gorgeous. Especially when their whole look is really just a basic "wig, make-up and robe" effect. It was nice to see an Argolin again in the background during "Dragonfire" - they really are a beautiful-looking race that were visually conveyed by the simplest of means. The story itself, though a bit contrived, is excellently plotted. The scenes were constructed in a very different and unique way compared to how they were written previously in the show. Expository dialogue is kept to a bare minimum and characterisation is kept to a maximum. Which is further enhanced by the acting in this story. All the performers are comfortable with the idea of subtlety and restraint. Something difficult to maintain in sci-fi when the visuals tend to be so over-the-top. Even Pangol's meglamania in episode four is handled convincingly. His voice is loud and furious, but the need to overdo facial expressions as previous meglamaniacal characters in the series have done, is kept to a bare minimum. All of these elements come together to give us one of the smoothest, "slickest" and most sophisticated stories the show has ever produced. Can we call Leisure Hive a "classic"? Probably not. But it isn't really trying to be. It's just trying to tell a nice little story about a small colony on a distant planet whose denizens are trying to either save themselves from extinction or, at least, leave a mark on the universe. And the Doctor, nice little hero that he is, helps them along in the effort. And that's what makes this story so wonderful - even if K-9 is written out of it in a mildly unbelievable way! There are some reputations that dont so much need changing as updating. For example, the companion Vicki is rarely mentioned without the word underrated lurking somewhere nearby; isnt it about time she became known as that companion who was really quite good, as a reputation for being underrated is really stupid when you think about it. This principal of outdated reputations also applies to The Keeper Of Traken, which has had a classic label fall from the sky and attach itself to it. Ive read a fair few reviews and while there are some that praise it to the last moment there are no more than for any other story and there is certainly no evidence I have found to justify such a lofty reputation. This appears to have led to the mildly amusing situation where there are loads of people who think that theyre the only ones who dont like it; many of the reviews Ive read are complaining that it isnt a classic. As for me, Ive only seen it a couple of times and not for years anyway, so Ill try and stay as open-minded as possible. The opening credits faded away and I was instantly bowled over by Tom Baker, who is more charismatic here than in any other episode for years. He is helped by a very witty script that makes for an excellent introductory scene on board the TARDIS. This is very rare, especially in the early 1980s (more specifically, in scenes with Matthew Waterhouse present), and shows that having a sharp, wise-cracking Doctor can be advantageous sometimes. The title of the story is dropped into the dialogue early on (and several times through the story) but as it refers to something specific in the plot then theres no problem: and the Keeper is a great character. His laconic manner does justice to the distinctive dialogue  Im sometimes wary when writers feel that peaceful and sophisticated cultures have to talk in a sub-Elizabethan fashion, but in truth it works more often than not  and keeps the sustained exposition scene at the beginning of this episode interesting to listen to. The idea of evil forces calcifying into Melkurs is fascinating, and the flashbacks on the scanner allow us to see the back story of the episode happen rather than just hear about it in a massive retrospective info-dump. This then is our first glimpse of Traken itself. The music score is appropriately lush but the sets, it has to be said, look like sets and nothing more. While they dont convince as being genuine exteriors they are nevertheless easy on the eye and ambitious in concept, and designer Tony Burrough should be praised for making a story that can never be called bad looking. Roger Limbs music score is appropriately lush, in particular the atmospheric Nyssas Theme which I have on CD on the Earthshock compilation album. Most notable however is how good Anthony Ainley is at playing Tremas; it shows how the massive ham salad that was the 1980s Master was really not his fault and he should not be blamed for John Nathan-Turners poor decision to make him play the part over the top. This all sets up a very enigmatic scenario of a mysterious evil subtly infiltrating a peaceful planet; its just a shame it turns out to be the Master really as this pantomime villain, although he had potential as stories like The Deadly Assassin show, doesnt stand up too well today. That said, this is one of his better outings and probably his best of the 1980s bar Survival. It takes a very long time for the TARDIS to actually reach Traken and in the meantime the consuls argue about a fosters death: this scene is overlong, but diverting enough. The walking Melkur statue is impressive and well directed by John Black, but let down by the squeak of polystyrene that can clearly be heard as it moves. This all leads to a very good cliffhanger as the Keeper appears to condemn the Doctor and Adric. So far my desire to challenge and unwarranted reputation is on shaky ground, as the first episode is actually very strong indeed. >From the beginning however, the second episode fails to capitalise on the strengths of the first. Kassias stage-fall is very silly, and Black shows he is really not an action director from the appalling scene where the Melkur kills as foster (No! No! Nooo!). Also, while John Woodnutt is good as Seron Sheila Ruskin is a bit of an all round bore as Kassia and Robin Soams as Luvic delivers his lines as if he thinks hes playing Sir Andrew Aguecheek in Twelfth Night. but you get the point) and she and Waterhouse certainly cant sustain a scene between them. The episode is amiable and always interesting and engaging, but I cant shake the feeling that its just treading water now. The vanished TARDIS is dealt with in terms of technobabble which is then carried over into the next scene dealing with the mysterious readings picked up in the grove, which undermines their credibility somewhat. The Source is cool, though. Kassias stuck-on eyes are really, really silly, far worse than Theas in Image Of The Fendahl, and this is a shame as the death of Seron is otherwise a very good and exciting scene - although, given that Kassia is standing over his body, the fosters believe circumstantial evidence remarkably easily to take the Doctor and even Tremas away so readily. The cliffhanger, like the last one, is dramatic, but it has to be said that this episode is a comedown from the first. It looks like Ive taken complete opposite stands on both episodes so Ill just pause to clarify my position: the second episode is good, it just doesnt do or say anything of substance. However, the excellence of the first has provided a strong foundation for further exploring the intricacies of Traken while the Melkur stomps around occasionally bullying poor Kassia, which gets the episode by until the finale. While the episode is by no means bad then, it in itself can never be called above average. Thankfully with this story the overall rating is governed very much by the whole rather than individual episodes. The third episode is more of the same really: after the set-up of part one, the story is still coasting. Like the second episode though, its never bad, and the revelation that Kassia is going to become Keeper on behalf of the Melkur is brilliant. Ruskin is actually better here, playing anger with more conviction than she did in the first part. How come nobody notices the massive collar that she is wearing, though? on his face almost trashes all credibility that the character has built up over the last eighteen seasons, and makes him look like a senile old man (he was looking old in his last season, come to think of it). Did nobody notice? Why, oh WHY, did nobody cut the scene? Im not going to dwell on it anymore, Ill just keep telling myself that it never happened. More technobabble follows as Nyssa carries an ion bonder instead of a gun, which is pointless. Once the Doctor escapes and returns to Tremass house there is the discussion about the plans to the Source; it has been remarked that the Doctor mentions a master plan three times. Im not sure if theres anything intentional going on here, but since its been pointed out I cant help but notice it. I have a funny feeling weve met somewhere before is a good lead in to the final revelation, and is symbolic of the way the pace gets going again in the final part. In fact, I was so drawn into the beginning part of the episode that I forgot to take notes. I cant tell you many details then, but rest assured theres nothing bad, except for that lame head-knocking sequence. Fans of pedantic trivia will note that the servo shut-off device used to knacker the Source was seen in Destiny Of The Daleks. Im going to mention the fact that Nemans death is very dramatic here as theres nowhere else to put it in my crudely-planned review. The revelation that the Master is behind everything is excellent, but the technobabble resolution is a disappointment. At least there is an effort to explain it here though, which is more than can be said for a lot of other stories (better ones, too). The final scene however is quite, quite brilliant as the helpless Tremas is killed and possessed by the Master. I have to thank Richard Callaghan (the Anorak himself) for pointing this out, but the Masters clock being set at four minutes to midnight is cooler than a very cool thing on a very cool day. Its just a shame the 1980s Master turned out to be so naff: it was a real wasted opportunity. This review has focussed on the differences between the episodes a lot more than my others have, but it is important. The Keeper Of Traken is superb at the beginning and at the end but, like a scaled-down version of The War Games, its very padded out in the middle. That said, its good padding: well written and always interesting, making for a every enjoyable tale thats a lot better than I remembered it being the last time I saw it when I was 17. It may not be a classic, but its a good story in its own right and it doesnt deserve the backlash it has received from a reputation that has become exaggerated and overblown. Tom Baker's final story has a really bright and creative idea in it. The planet of Logopolis itself is a really very exciting. The idea of a society that is completely based and has such faith in the power or math is quite good. A faith that is so strong they can actually use it to hold back entropy is such a powerful idea that it deserved to be at the front of this story instead of just the background. Sadly enough there isn't much else in this four part story to get excited about. Baker's color and charisma were pulled way back for this story and it hurts. It may have worked as an idea to promote the dark and funeral like feel of the story but without the Doctor there are no pick up moments or bright points in the story and it just makes it dreadful to watch. The mysterious Watcher in the background doesn't add much depth to what is going on. Even the TVM regeneration was better than this. The first wheel spinning episode is incredibly dull. The Master lands his TARDIS around a real police box and disguises it as a police box so the when the Doctor lands his police box he'll actually be landing both around and inside the Master's police box. Then the Doctor and Adric wonder from console room to console room. Soon Tegan manages to get herself into the TARDIS so she can start wondering from corridor to corridor. YAAAAAAAAAAWN! The story never really picks up from that point. Adric is actually the only credible character in the story. Most of the tale is told from his point of view as he learns more from the Doctor, asks the right questions, and develops quite well. Tegan has a miserable first start. Janet Fielding gives a way over the top performance that has no credibility to it at all. She was supposed to be a strong independent character but just comes off as being bitchy with personality swings you almost have to duck to avoid. There's nothing wrong, really, with playing a character at 100% but switching from one direction, doesn't believe a word the Doctor says, to another, desperately dependant on him, as fast as lightning is really lousy for character development. She decides that he is her only hope of survival and is counting on him to get her back to Earth so she snaps into action and completely ignores what he tells her to do. The only character that comes of worse in this story is the Master. For the first two episode he turns it into a slaughter fest and all we get is the Master's hollow laughter in the background. To make evil characters work there has to at least be a reason for them doing what they do but there is none. A policeman uses a telephone from the box and the Master kills him. Aunt Vanesa opens the police box door and he kills her. As the story progresses he goes to Logopolis so he can start killing more people at a time. His evil scheme to finally destroy the Doctor is set in place by killing people at random? Even with that simple of a plan he fails miserably and gets in way over his head. The plan is as flat and as one dimensional as Ainley's performance. He never had the charisma or depth that an actor needed to make the character work and never improved much from his introduction. His message to the peoples of the universe that he tries to send out is so weak and laughable I can't imagine it being taken seriously by anybody who came across it. He's basically threatening people who've never heard of him or know the truth about entropy that if the universe doesn't immediately accept him as their ruler he will allow entropy to destroy everything. Nobody will be shaking in their boots when they get that signal. After it's all said and done this story is a miserable waste of time. The worst of the regeneration stories. I am quite surprised I enjoy this story as much as I do because re-watching recently I have noticed just how much the production is sort cobbled together. Certainly it has the very poor production values for the glossy season eighteen and has the most traditional plot ever seen in the shows history. However the story manages to overcome these drawbacks and escape any great criticism on the strength of the acting and the enthusiasm of the writer Terrance Dicks. If you locked Philip Hinchcliffe, Graeme Williams and John Nathan-Turner in a conference room together and asked them to produce a story I should imagine it would turn out very much like State of Decay. The story has several unique flavours that three of the most influential producers of the show adopted during their time. Certainly it is an expression of the gothic horror Hinchcliffe brought to the show being for all intents and purposes a Hammer pastiche (popular of Robert Holmes, top script editor during those wonderful three years) but then it also has a strong comedy flavour favoured by Williams during his fabulous three years of frothy entertainment. State enjoys its sarcastic edge, poking fun at the genre it is mimicking and happy to provide a good backbone to the story where the traditional plot fails. And nestled quite comfortably in JNTs stylish first year as producer it also contains some strong scientific ideas, Chris Bidmead refusing to let the story wallow in melodramatic happenings. It has possibly the strangest feel of any Doctor Who story, the three influences each taking centre stage sporadically throughout the four episodes but mashing together into something original as a result. Camilla has an unusual taste for Romanas blood, rushing to tend her hand when she is cut and staring at her with lust in her eyes during their initial scene together. Her there are compensations whilst gazing at the aristocratic Time Lady still sends shivers down my spine. Plus Aukons interest in Adric (oh yuck) is a fine indication of his feelings, I have never heard anybody a man whisper come in anothers ear quite so erotically before. The ultimate demonstration of just how sensual they are comes in episode four where Aukon holds the Doctor and Romanas hands together whilst Camilla and Zargo touch their shoulders. An extremely revealing moment. very funny and quite scary too. Impressive. He flits between the jokes and the horror with ease, no wonder Lalla Ward enjoyed working with him so much. William Lindsay doesnt get as many chances to light up the screen being the most subdued of the Three but his quiet Why am I still afraid? says everything about his thoughtful character. We are mere seconds away from Tom and Lalla grabbing each other on set and getting it on! Another delight of this story is the terrific amount of flirting going on by the two leads. It is the last story that they spend any substantial time together and they make the most of it, every scene they share punctuated by a playful attitude that would be sorely missed in the next three years. Episode three comes as close as they dared, sharing a cell, swapping stories and complimenting each other with coy gazes. Have the Doctor and his companion ever been this close? Not even his moments with Susan can touch the warmth expressed between these two and it is wonderful to watch. You get very involved in their relationship and as a result the next story is a real heart breaker (especially when you think who the Doctor will be stuck with).  Kill the brat! Kill the brat! the story doesnt really want to scare you but give you a good time and by its climax I was satisfied, greedily so. My qualms about the production extend only to the special effects, which are extremely disappointing. Doctor Who is infamous for its quaint FX but State of Decay has no real excuse, The Leisure Hive and Full Circle before it both had sumptuous production values. It would appear the money has run out and were forced to laugh at the pathetic shots of the tower, so obviously a model and how Terrance must have been disappointed when they sabotaged his grand finish involving a scout ship and a Great Vampires heart! Sky ray lolly anyone? Even more subtle effects such as the rock Romana throws at Aukon are sadly inefficient. clearly in need of a paint job. The rebels base with its scientific instruments strewn about is exceedingly dated but suits the story perfectly. Even the TARDIS is looking a bit shabby these days, the queasy console groaning as the column rises and falls. The feeling of lost hope the story suggests is complimented by the design. Good work. Isnt the music a joy? Why hasnt this score been released on CD like the others in season 18? Paddy Kingsland is making a statement; he refuses to let the show drag you into its horrific material and instead opts for a shocking rock score, filling later episodes with some real pulse racing stuff. The 80s have arrived folks and lets be LOUD and PROUD about it! The music at the climax is extremely exciting. Compare this to Dudley Simpsons cod horror score for The Brain of Morbius (good though it was!) and see how things have changed in the new decade. I really like State of Decay even if it does stick out like a sore thumb surrounded by all the hard SF tales around it. It doesnt want to impress you with scientific mumbo jumbo but simply tell an effective story. It succeeds, a final stab at experiencing the fun of the universe before all the serious stuff starts.